Obama launches new era of cooperation with India. Indian Prime Minister Narendra Modi and U.S. President Barack Obama walk through the gardens between official meetings at Hyderabad House in New Delhi on Jan. 25, 2015. 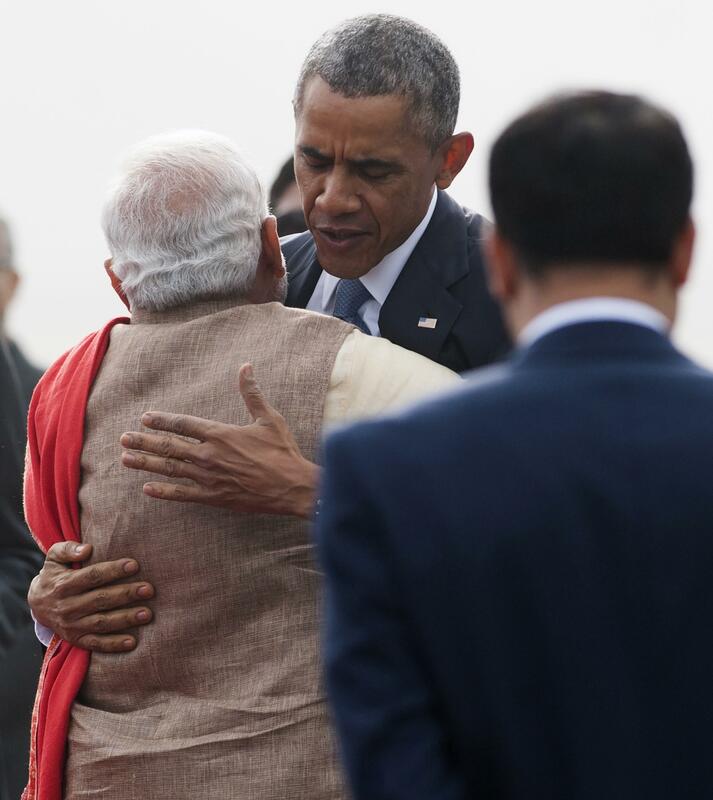 Indian Prime Minister Narendra Modi (L) hugs U.S. President Barack Obama upon his arrival on Air Force One at Air Force Station Palam in New Delhi on Jan. 25, 2015. The climate agreement included mostly minor initiatives compared with the deal Mr. Obama made with China last November, and it was unclear whether American companies would that agree the nuclear pact offered sufficient protection from potential liability in the case of mishaps to justify the investment. Regardless, everyone makes sure to emphasize that the important thing here was the “atmosphere of amity,” as the Times puts it. “From the start, the day was more about putting their personal bond on display,” notes the Associated Press. “The chemistry that has brought Barack and me closer has also brought Washington and Delhi closer,” Modi said at one point. Despite all this positive talk though, Obama is cutting the trip slightly short to go to Saudi Arabia on Tuesday to pay his respects to the royal family for the death of King Abdullah.